Invitation to Two June Art Events! #1. On Friday, June 1st, my new Colorado Springs downtown studio will be opened during First Friday Art Walk, from 5pm-8pm. If you are in the area, please stop in. Several other art venues in the neighborhood will be open during this art walk. There are many wonderful restaurants near-by. 2418 W. Colorado Avenue, Colorado Springs, CO 80904. Entrance is in the middle of the block of Colbrunn Ct, just north of Colorado Avenue. Note: There is no available elevator to the 2nd floor. There are 22 stairs with two landings. 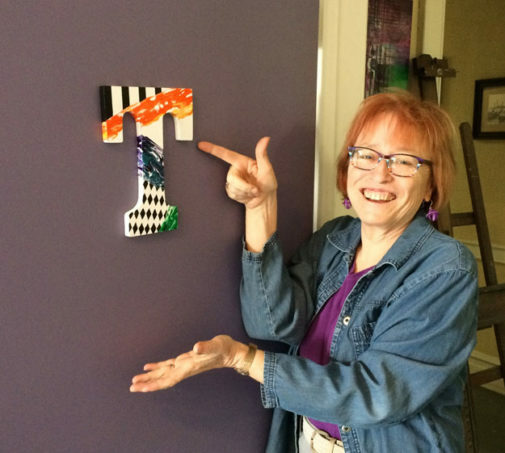 I am in Studio “T.” Each studio is identified by a letter and its own door color. Of course I had to paint mine purple. The winery and restaurant hours of operation are: 7 days a week, 11:00am – 5:00pm. There will be no opening reception for this show. I will be showcasing my wine and spirits paintings that will delight you in color and in concept. They just might make you smile. 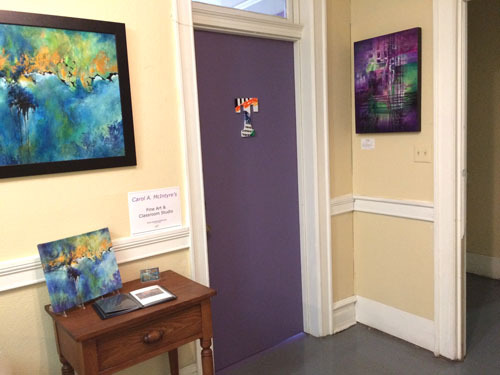 Several abstract paintings conveying color harmony and intrigue will also be on display. Here is my most recent painting, “Let It Pour!” 24″x18″ mixed media on board. Feel free to invite others by forwarding this post or sharing it on social media. 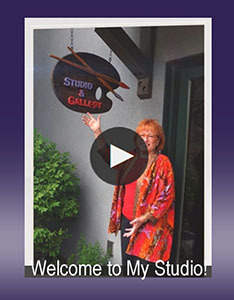 On Friday, May 4th, my new downtown studio is opening during First Friday Art Walk, from 5pm-8pm. If you are in the area, please stop in. Several other art venues in the neighborhood will be open during this art walk. There are several wonderful restaurants near-by. This is the first time I will have my poured paintings available for sale. PS If you want to come before the main door opens at 5pm, please call me at: 719-510-0006. I am sure I will be there from 3pm on. I had fun jazzing up the “T” for my door. I even poured some paint on it. I look forward to seeing you Friday! 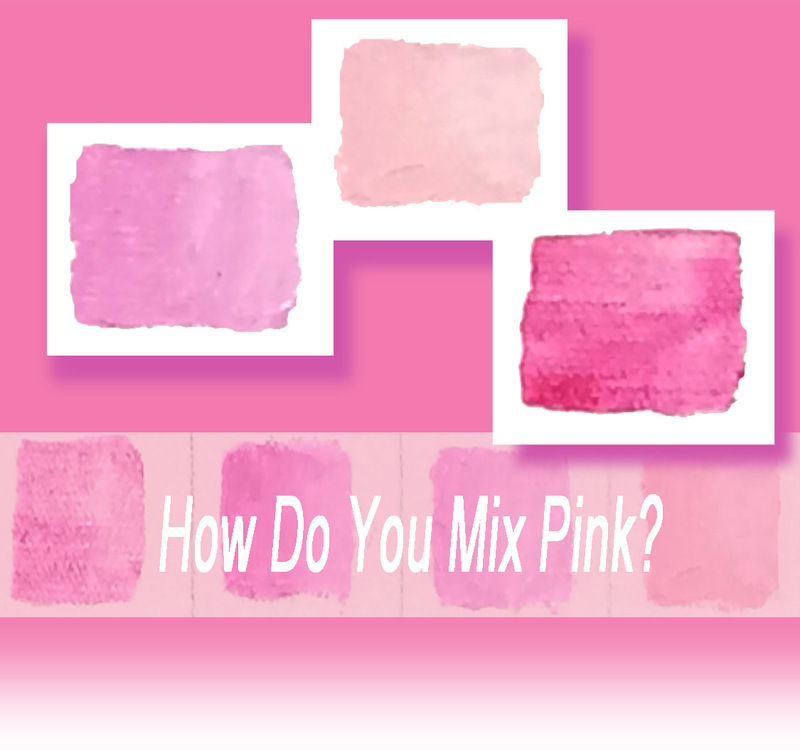 How Do You Mix Pink? Painters, how do you mix pink? I suspect you grab a red, add white and Voilà! Or watercolorists just add water. However, executing this color mixing approach does not always result in a satisfactory pink for a particular subject or painting. 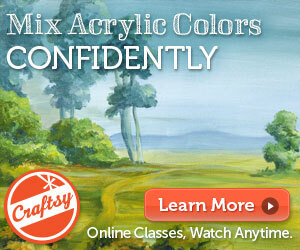 A more systematic method to mixing this seemingly simple color can be helpful. Like every color, pink encompasses a full range of hues. Pink is a pastel color sitting in the light value range. This can be one reasons why it can be a challenge to mix. When Hunter’s mother was explaining to a friend that her 5-year old son wanted to be an artist, he immediately piped up and proclaimed, “I am ALREADY an artist!’ She was surprised to hear this emphatic statement and his passion about it. Out of the mouths of babes and innocence comes authenticity and confidence. Don’t you love it? I like this story because it made me reflect upon my first career proclamations. I know that it was not to be an artist. Most likely it was something related to an event or a professional that I had recently met or experienced such as a dancer or a teacher or a house builder. Lisa, Hunter’s mother, told me this story a few days before my annual open studio event that I have every fall. She came to my studio on her own. After perusing my work and continuing our enjoyable conversation from a few days earlier, she decided she wanted to return with her son, now seven and a half years old. A couple of hours later, Lisa, Hunter, younger brother and dad all arrived. 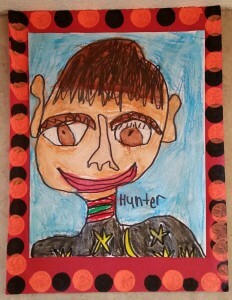 Upon entering my studio Hunter looked up and around and stated, “This is awesome!” Wide-eyed he proceeded to look around, not just at my paintings but at many of the other studio items. He particularly liked the easel. Soon I will be visiting Philadelphia for the first time in a couple of decades. Few people know that I grew up west of Philadelphia along the Main Line. I spent my “Wheaties” years there. In other words, ages 8-18. Then I headed back to the mid-west, where I was born, to attend Bradley University in Peoria, IL, and subsequently graduated from Indiana University with bachelor and master degrees. After Indiana, I struck out on my own for Minnesota and lived there for 26 years. Currently I reside along the Front Range of Colorado loving the weather and vistas as well as easy access to our remote mountain cabin. Fro m a 7 year old’s perspective, the contrast from Iowa to Pennsylvania was a jolt. I remember my older siblings and I comparing various differences we experienced as we adjusted to our new surroundings. First, there was the funny Eastern accent. We could never quite stop laughing over the pronunciation of ‘water,’ which sounded like ‘wooddar’ to us. Then there was new vernacular to adjust to, such as: sneakers (tennis shoes), dungarees (jeans), teeter-totter (see-saw), etc., which made us scratch our heads. Of course, our new friends wanted to know about cowboys and Indians, and questioned whether we had in-door plumbing. And they could never remember we were from Iowa and not Ohio. What the east offered that I could not have had if we had stayed in small-town Iowa, was diversity, history and cultural opportunities. For this I am forever grateful. A train runs for over 30 miles straight west of Philadelphia to Paoli, out through the areas where we lived. (My father took this train into work every day.) Periodically, my mother would take us into the big city on this train. I loved taking the train because I could view parts of the world I could not see from a highway or a car. I also adored the rhythm of the train and the people watching. I cherish those cultural excursions and know that I have benefited from the mixture of a mid-west and eastern upbringing. This week I will be returning to Philadelphia from my 45th high school re-union. Do I dare admit to that? LOL! Fortunately, I will be staying with a high school friend who lives in downtown Philly and will not be out in the corn fields where my high school is. I am sure the corn fields are now full of homes and commercial properties. This will be my first time visiting Philadelphia as a professional artist. There are so many places I want to explore, and we must not forget all of the flavorful ethnic eateries to inhale. 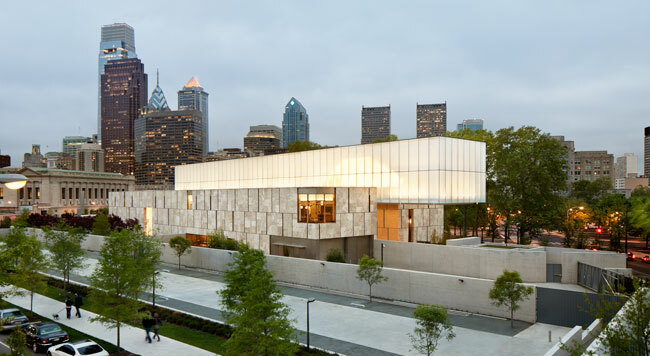 The Rodin Museum is just down the street from the Philadelphia Art Museum, and The Barnes Foundation has a new downtown location. The Barnes holds one of the finest collections of Post-Impressionist and early Modern paintings, with extensive works by Pierre-Auguste Renoir, Paul Cézanne, Henri Matisse, Pablo Picasso, Henri Rousseau, Chaim Soutine , as well as American masters Charles Demuth, William Glackens, Horace Pippin and Maurice Prendergast, Old Master paintings, important examples of African sculpture and Native American ceramics, jewelry and textiles. Unfortunately, women artists are not well represented at the Barnes. There are also exhibits at the Pennsylvania Academy of Fine Arts, which was the first art school that allowed women to attend life drawing classes in the 1800’s. While in high school, I took the train downtown for a summer sculpture class at the Moore College of Art & Design and will make a point to see the contemporary art exhibit that is currently on display. With only three days to peruse the city, it will be a challenge to pick the candy I will want to taste. There are many more enriching sites beyond what I have mentioned. I hope to also visit some contemporary art galleries. It is always interesting to see how the art can vary from one region of the country to the other. As I wander down memory lane and re-connect with old high school mates, I will be reflecting upon how these visits to Philadelphia as a youngster, impacted my journey as an artist. 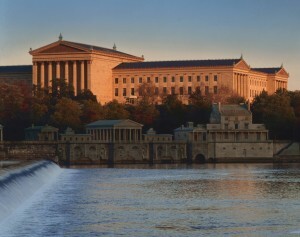 if you are an artist, where would you visit in Philadelphia? How do you approach cultural areas you will soon visit? How do you decide which ones to experience?